Or: Why I know I could never be a teacher. I don’t know how teachers do it. “It,” specifically meaning, be a teacher and a parent at the same time. I come home after working with other people’s kids all day and all I want is to lay around and be a blob. I don’t want to do chores, any cooking more complicated than spaghetti, or any extra work. I do consider myself lucky to have the privilege to teach afterschool classes. They get to be fun. The kids want to learn about the topic (they signed up for the class, right?) I get to go with the flow and do stuff based on what the kids want to do. Novel Writing sounds like this crazy ambitious class for 2-5th graders, right? It sounds impressive, but I have to say I completely winged it today. I didn’t prepare at all. I made it up as I went, really. It worked, though, because I’ve gotten good at this. Spread out in the halls and write descriptions of stuff without saying what it is. Return to the group and read your description so they can guess what the thing is! Now, free time to write your novel! Oh, you’re getting stuck? Let’s get back together as a group and discuss why you get stuck and what strategies you use to get unstuck! I also love that I’m still doing the Novel Writing Class, which I’d originally based around NaNoWriMo for the month of November and had planned to end in December with the end of the first afterschool session. I had to repeat it because all of the kids begged me to. I had them do evaluations and they asked for more writing time, to have the class on more than one day per week, and more chances to share and workshop. What a great coincidence. As I was drafting this post, I came across this article posted on Twitter by NaNoWriMo: Do You Write With Your Students? It’s semi-related to what I was writing in this post, and I like it. Well, I got through January with a pretty good amount of blog posts for my one blog per day goal. However, I think I’m going to step back and re-evaluate that goal. I do have to say I agree. I was planning to post pictures on days that I didn’t have much to write about, but I don’t always take that many pictures. So, I’m going to change my goal to a 2 blog post per week goal. The important goal, the one which I’ve only missed two days of, is my overall writing goal (not blog posts). I’ve written every day in January, except two, and that’s pretty good. I’m quite pleased with my accomplishment there. I’ve structured my mornings so that the writing time is built in and expected. Woo hoo! And now, if you’ll excuse me, I’m off to do some beading. I’ve promised myself for awhile that I would make myself a pretty lanyard for my school I.D. badge, but just haven’t had the time. Now I’m making it! 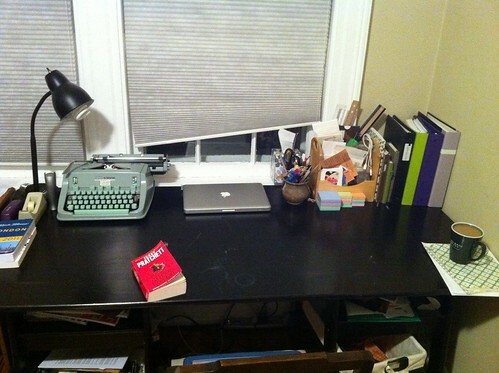 I even cleaned my desk so I could really enjoy it.